Terra-Cycle: Gimme Your Energy Bar Wrappers! For every energy bar wrapper I collect, 2 cents goes to my charity of choice. I chose Rebuilding Together, of course. Please visit this site for more information. You can also sign up for other collection drives. This is also one of those overdue post that I was meaning to write but decided to run instead or watch TV, I forget..haha. I was watching the food network one day a few years back and despite the fact that I almost never cook, this receipe was so easy and tasty looking that I decided to give it a go. I've since made this pasta many times over and have even made it for pre-race day dinners. It is really lite and fresh and I almost end up eating more than I need. 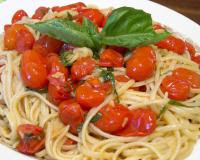 :) Serve this up with some fresh grated Parmesan cheese, some warm bread with some butter smother on it and you are good to go on the big day. The link below is the original recipe and I mostly make it that way. Sometimes I even throw in a can or two of chopped clams. I'm sure everyone has their own pre-race pasta dish, but if you don't, here is a good one. You can essentially look at the ingredients list to judge if you will like the flavor. Looks something like this (I found this picture on the web of someone who actually made this dish, although the one I make looks just like that). So I've been meaning to write this review for quite some time but just never got around to it for some reason or another. So this is overdue. This was one of those products I discovered by word of mouth. A friend of mine was telling a friend of his, who is an endurance biker that I ran alot and the biker guys recommended this stuff to me. What can I say about this stuff except that it has saved my cramping calves on more than one occasion. This stuff is basically electrolyte in pill form, but it is so much more. This stuff is great for long runs and race day, especially if it is hot (ie LA Marathon 2007). You can use the link below to get to the Hammer Nutrition site who manufactures this stuff. They mostly market to endurance biker but I figure what's good for the biker is also good for the runner. :) I mean just ask Lance! Hammer also makes this great energy gel that I also love and will review at a later time. I've shared these pills with my sisters on some of our long runs together and they are giving it the thumbs up. Honestly this stuff will help you out if nothing else at those dreaded last 6 miles on that big day. But if you plan to use this stuff on the big day, you should probably buy some and test it out on practice runs to make sure your stomach will not object to it. I have a very sensitive stomach and this stuff does not bother me but everyone is different. I am raising money for Rebuilding Together - West San Gabriel Valley via the Los Angeles Marathon. My goal is to raise at least $500, and so far, I am a notch above $200. I hope we are able to set up our PayPal account soon so I can obtain the donations more easily! Rebuilding Together is a nationwide network with 250 affiliates, fifteen of which are located in Southern California. Your pledge donation will encourage the entrant, and help Rebuilding Together repair and modify the houses of low-income homeowners, particularly the elderly or those with disabilities, so they can continue to live independently in warmth & safety, and with dignity. Hello, everyone! I am fundraising for Rebuilding Together - West San Gabriel Valley, an organization that rehabilitates the homes of older families who are not able to do so themselves due to their age or health. On National Rebuild Day (the last Saturday in April), we gather to rebuild as many homes as we can afford throughout the West San Gabriel Valley. We did 4 homes last year and 13 the year before -- this means we are extremely dependent on our funding! I have been involved with the group for over three years, and now I have the privilege of serving as a board member. It is amazing how a little work can go a long way. By simply installing some grab bars or a wheelchair-accessible ramp, debilitating falls or immoblization can be prevented, and the quality of life for seniors and their families is dramatically improved. Please consider contributing to this cause by sponsoring me in the Los Angeles Marathon on March 2nd! The suggested donation is $1/mile (26.2 miles), but ANY amount is very much appreciated. As you might know, I've been faithfully training for what will be my second marathon (FYI, my race count = marathons: 1, half-marathons: 7, <10k: 1). In addition to the weekday load, Sunday mornings are spent training for hours. As predicted, both my immunity and muscles are having their ups and downs, but I am VERY motivated! So short of anything very out of line, I WILL be crossing that finish line with you all spiritually with me!!! For more information, please feel free to contract me. I have pledge forms in both hard (see me in person) and electronic forms (don't forget to note "West San Gabriel Valley" as the affiliate you wish to help). All donations are tax deductible. Again, I genuinely appreciate your support, and I hope to soon return your generosity in some form (tech help, lunch dates, poetry, exercise companion, tidbits I'm learning in grad school... you name it -- I am serious about this). One last thing: our National Rebuild Day is Saturday, April 26, 2008, 7:30 am. If you are interested in volunteering for this event, please contact me! The Pacific Shoreline Marathon/Half-Marathon/5k in Huntington Beach, CA was renamed to the Surf City USA Marathon/Half-Marathon/5k this year, reversing the course (or so I heard). I wanted to run this race last year, but it never panned out. And since this was "inaugural," I decided last month to hop onboard. I had just run Carlsbad Half two weeks before and Orange County two weeks before that, both with decent but not PR times. Since this was my last race before LA Marathon, I was hoping to make good of it, since the two half-s scheduled for post-marathon might not go so well. I got up at 4:45 and was out of the house with my sister in an hour. It had been raining for most of the night and was still doing so as we waited in line on Pacific Coast Hwy for the shuttle to come. The wind kicked up relentlessly as the rain beat down hard on our backs. Ill-prepared in some waterproof shorts, long-sleeve tech shirt, and mylar wrap from another race, I was shivering uncontrollably for half an hour. One of the guys in line shouted, "Aggh, Kelly Clarkson!" (reference from The 40-Year-Old Virgin movie) as a huge gust blew us away. I chugged about 2/3 of a tiny bottle of Gatorade Rain on the bus. Got to the start at 7:50, 5 minutes too late for the first wave start (the marathoners had taken off at 6:15). Got as close to the front of the next wave as possible and took off. I was a little irked that they were playing summer/beach music at the start, as if they were taunting us, but oh well. My wrap fell off in 2 seconds when a gust came, so I just went on without it. The wave start system worked so well. I didn't have to trip over walkers or become a football player at any time during the race because we were all well dispersed, even if I didn't get into the right wave. In addition, I guess the field was so open that my friend spotted me, and we had a brief conversation. I had also spotted my sister at around mile 8 and ran with her for about a minute before she took off ahead of me. Mile 3 split was 26:45. Mile 7.75 spilt was around 1:10. I was slightly weirded out by the strangely placed mats. I usually want a 10k split time because I've never done a 10k, but I kept running and running and found no mat until a good while later. Anyway, I think I was so busy braving the wind and avoiding puddles that I didn't bother to look around very much. And anyway, everything was too foggy and grey to really notice anything of beauty. The course was pretty much flat except maybe two small inclines. There was definitely some shore visible for a good stretch of the race, but all I could think about was a warm hug, blankets, or hot cho colate. I made sure to drink a little bit at some of the water stations, though I was not really thirsty and wound up passing more of them than usual. Admittedly, at a few points when I felt that my mouth was dry, I opened my mouth and tried to drink some of the rain water. The sports beverage was Amino Vital, which tasted a bit weird but did not upset my stomach probably because I did not drink very much. They were also giving out my favorite Clif Shot Bloks, but I did not want to bother with them. I mostly felt good throughout the race, as good as one can feel with winds blowing against you and rain spattering everywhere, shoes squishy, snot blowing everywhere (residual from a cold I had this week, not that I was getting sick from the rain), etc. The outside of my right thigh was tightening a bit toward the end, but I managed to change my stride a bit to help it. I often imagined that I was swimming or something so that the totally soaked feeling would seem a little less foreign to my body (I have only run in heavy rain once before when I was caught in a flash flood during mile 7 of 10). The whole time, I felt very sorry for the volunteers and showed my appreciation to them (by enthusiastically pumping fists, etc.) and those who were on the course supporting people. I think it is worse to be standing there than running. Anyway, after a few miles of not really knowing how much I had left, I saw the finish and got a chip time of 1:59:31, a PR by about 6 minutes. More than skill, I think I ran faster just to get out of those conditions. The medal was VERY cool... a nice surf board. The post-race food was also adequate and good, although we had to walk quite a ways to get it. I've wanted to run a sub-2 all season, so I definitely feel as though part of my life is complete. Overall, I liked this course and would do it again if I can predict the weather better.